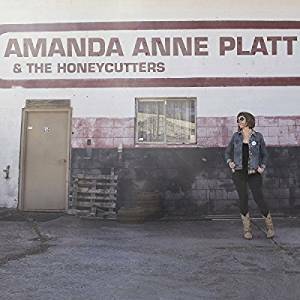 This is the third Amanda Anne Platt and the Honeycutters album that I've reviewed on this site (and their sixth overall including one live recording) and each one has paid multiple dividends for the repeated listening sessions. Irrespective of the stories subjects there is an appealing warmth to everything this band records including those lyric driven songs that have a powerful sense of drama as well as addictive ear worm melodies. Amanda Anne Platt's vocals have a beautiful character laden femininity that is allied to a lovely rural earthiness, helping create a powerful country atmosphere that for good measure seems to blend with a little urbanity, all in all giving her music a nice edgy modern country feel. Whilst previous albums have all been released by 'The Honeycutters' it is no surprise that they have eventually got around to prefixing the band's name with Amanda's although this should be taken as no reflection on the excellence of her band mates. The five members, including Amanda, are very much a complete band but when you look at the fact that Amanda co produced with Tim Surrett, (who also carried out the same function on 2016s tremendous 'On the ropes') takes all lead vocals and wrote all of the thirteen songs on this recording it is fairly obvious that she has earned the right to have her name upfront, in fact her name and huge talent gives the music buying public an incredibly strong focal point. There are many artists with their name in front of that of a band who contribute much less. The core of the band remains the same with one change from the previous albums. Tal Taylor is no longer a member which means the sacrifice of the mandolin but Evan Martin has come in on keyboards and B3. The remainder of the band is Amanda on lead and harmony vocals and acoustic guitar, Matthew Smith plays pedal steel and electric guitar, Rick Cooper, bass and acoustic guitar and Josh Milligan on drums, percussion and backing vocals. The album opens with Birthday song, with its nice sharp percussion and piano getting things moving slowly, soon joined by Amanda's gorgeous vocal, with steel guitar and lovely harmonies adding a little colour. As the song settles down a fiddle joins the quite sparse arrangement on a lovely reflective tale of someone who is pretty much at peace with the world and her place in it. Long ride, again includes steel guitar and percussion with acoustic guitar getting the song off to a mellow start before Amanda's expressive vocal takes over on a song about philosophical differences in attitude to life, and death! There is an excellent piano break that segues into a steel guitar to heighten the flow of the song. Acoustic guitar, keyboards and Amanda's beautiful evocative vocal on Eden highlight a powerful rural tale. The restrained percussion and deep throbbing bass eventually join in and ground the song with a melodic chiming guitar on a powerfully descriptive tale of life in the 'heartland' that pretty much helps define the edgier side of modern country music and the trials and tribulations of modern day life. The various guitar sounds help to expand the sound and create a perfect setting for a story that many can relate to. A mellow organ and melodic twangy guitar with percussion and bass are soon joined by Amanda's beautifully evocative vocal on Guitar case, a song that perfectly describes the life of a, or perhaps all, modern day musicians. Not the most optimistic of tales but it does go some way to showing how driven the itinerant musician is. Finally, on Learning how to love him, a gentle melodic guitar provides the only support for Amanda's beautiful vocal on an evocative tale that reflects on the ups and downs of a very long term relationship, a surprisingly observant series of reflections for someone who is too young to have that experience herself. Amanda Anne Platt is such an incredibly talented songwriter with her descriptive, poetic tales containing a series of sometimes knowing and at other times reflective snippets of worlds that most of us can relate to, sometimes wholly or at least in part. Her songwriting has always been the icing on the Honeycutters cake but even the huge quality on previous albums has been upped by at least a notch on this recording. If the writing is the icing, then the decoration on that icing has to be the tightness of the arrangements and the bands superb playing, fairly obviously topped off with the cheery on top which is Amanda's beautiful, evocative vocals! This is a band whose back catalogue is a match for anyone's and yet still they're improving. Modern country music really doesn't get much better than the highly individual style of Amanda Anne Platt and the Honeycutters. The band is currently on a U.K tour so check their website for details but they will be playing at the Con Club, Lewes next Thursday the 17th August 2017. See you there!